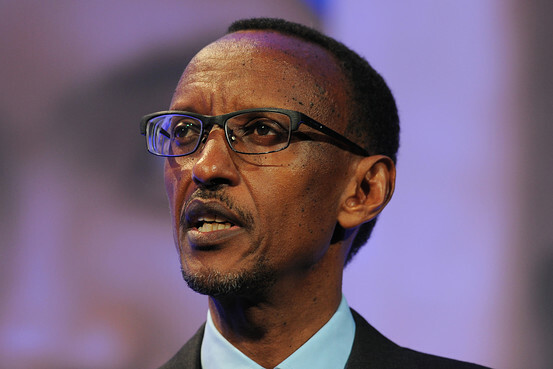 DAVOS, Switzerland—Rwandan President Paul Kagame said his country’s former spy chief, found dead in Johannesburg early this month, had posed a security threat to Rwanda, but he denied any involvement in his death. Mr. Kagame said that Patrick Karegeya, a leading opposition figure who had been granted asylum in South Africa, was part of a group that threatened Rwanda and its people. Mr. Kagame didn’t describe the specific nature of the threat, but said the Rwandan government would have been within its rights to have him killed. Mr. Karegeya was found dead in a luxury-hotel room on Jan. 1. A bloody curtain cord and towel were later discovered in the hotel room safe, the South African government said. Mr. Karegeya had run Rwanda’s foreign-intelligence service for a decade but left the country in 2007 after a rift with Mr. Kagame, who later accused him of orchestrating a series of grenade attacks against civilians in Rwanda’s capital, Kigali. Mr. Karegeya denied involvement. Interviewed in his high-security hotel room in Davos, where he is attending the World Economic Forum, Mr. Kagame compared Mr. Karegeya’s death to the assassination of Osama bin Laden, in a 2011 U.S.-led operation. “The president and everybody in the United States…were celebrating,” Mr. Kagame said. His comments could complicate Rwanda’s relationship with South Africa, which has become something of a magnet for Rwandan dissidents because of its relatively strong legal system, which helps protect political refugees. Several dissidents, however, have been attacked on its soil. In 2010, South Africa recalled its ambassador to Rwanda following a suspected assassination attempt of Gen. Kayumba Nyamwasa, a former Rwandan army chief who had turned critical of Mr. Kagame. Mr. Nyamwasa was shot in the stomach in the driveway of his Johannesburg home, but survived. Several suspects are currently on trial; Rwanda’s government has denied any involvement. The U.S. has also expressed concern after the murder of Mr. Karegeya. Last week, the State Department said it was troubled by the succession of what appear to be politically motivated killings of prominent Rwandan exiles. Mr. Karegeya had accused Mr. Kagame of flouting human rights, repressing freedom of speech and crushing political opposition. In 2010, he co-founded an opposition party called the Rwanda National Congress with Mr. Nyamwasa. Mr. Kagame, who was elected to a second term in 2010, is seen by many Western leaders and international organizations as a pragmatic, pro-business politician who brought peace to his country after the 1994 genocide. He says the RNC is linked to crimes against Rwandans. “They have made statements that threaten Rwanda as a state and even the people of Rwanda. But still it’s not about statements. They’ve done things that have led to deaths of Rwandans,” Mr. Kagame said, accusing the group of links to the perpetrators of the genocide. A top RNC leader in South Africa, Etienne Mutabazi, challenged Mr. Kagame to provide proof of links to terrorists or perpetrators of genocide. Mr. Kagame said that Rwandan authorities had passed information to their South African counterparts regarding unspecified activities Mr. Karegeya and others were involved in from exile in South Africa. A spokesman for South Africa’s foreign ministry declined to comment, referring questions about any warnings on Rwandan dissidents to the country’s security agencies. Posted on 28th January 2014 by newsafrica. This entry was posted in Africa, Democracy, Leadership, Paul Kagame, Rwanda, South Africa and tagged Bill & Melinda Gates Foundation, Kagame, Karegeya, Patrick Karegeya, Paul Kagame, Rwanda, South Africa, United Nations Population Fund. Bookmark the permalink.